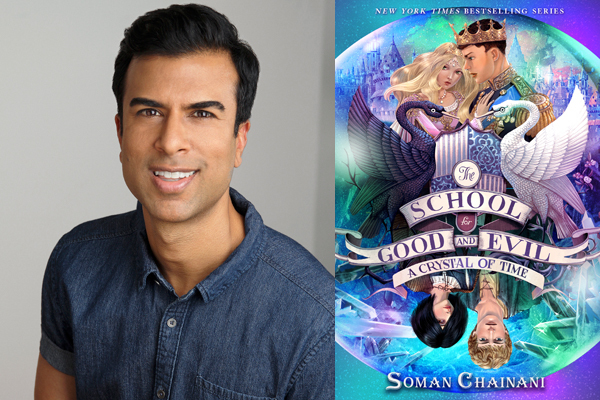 Soman Chainani will introduce the fifth installment in his New York Times bestselling fantasy series, the School for Good and Evil. Sophie, Agatha, and their friends must find a way to overthrow the sinister evil that twists lies into the truth and seeks to rewrite their story. While you're waiting for the event, you can enroll at the School for Good and Evil and take the entrance exam! In this fifth installment in Soman Chainani’s New York Times bestselling fantasy series, the School for Good and Evil, Sophie, Agatha, and their friends must find a way to overthrow the sinister evil that twists lies into the truth and seeks to rewrite their story. At the end of Quests for Glory, Truth had become Lies, and Lies had become the new Truth. A boy called Rhian had declared himself the true King of Camelot, forced Sophie to be his queen, and captured Tedros, Merlin, and the rest of the School for Good and Evil Quest seekers. In this fifth book in the School for Good and Evil series, Sophie and Agatha must find a way to save Camelot and help Tedros reclaim his rightful throne . . . before Rhian’s lies rewrite their stories. Soman Chainani believes in fairy tales wholeheartedly. When studying at Harvard, he practically created his own fairy-tale major. He is an acclaimed screenwriter and a graduate of the MFA Film Program at Columbia University. His films have played at more than 150 film festivals around the world, and his writing awards include an honor from the Sun Valley Writers’ Fellowship. He lives in New York City. You can visit him online at www.somanchainani.net.